Starring Dennis O'Keefe, Dame Judith Anderson, Francis Neal, Eric Blore. What is a “B” Movie, Anyway? A “B” movie’s humble beginnings can be traced back to the beloved double-feature format. You see, back in the day, audiences went to movies because they were an affordable type of entertainment - long before video games, personal computers, and IPods! The “B” movie followed the “A” list films, better known as the main feature, and was sandwiched in between the coming attractions, newsreels, a serial, cartoon or humorous short film, and sometimes a public service message. So, the phrase “going to the movies”, really meant that the average movie consumer got a lot more viewing value for their money! The “B” movie formula also served as the training ground for many cinematic performers and movie artists (directors, writers, cinematographers, etc.) to learn their craft. It also gave birth to cult classics and sleeper hits, helping to develop many genres (most notably the noir, horror, science-fiction, and low-budget thrillers find their niche – and an audience. Studios didn't spend a lot of money on a B project and they were often shot quickly, sacrificing quality along the way. The action and dialogue resulted in a fast-paced viewing experience, with plenty of melodrama, violence, and racy scenes to keep us watching. Sometimes pre-war movie propaganda can take a strange turn when they surface decades later. 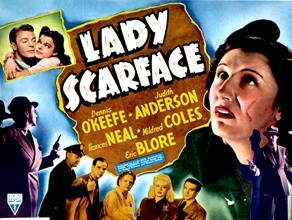 Lady Scarface, starring veteran actress Judith Anderson, as Slade, (long before she was tapped as a real “Dame”), gives us a tough female gangster boss, who rules with an iron fist over her small posse of cheap crimesters. This movie, directed by Frank Woodruff, spins a tale of murder and mayhem, bringing Dennis O’Keefe (Lt. Bill Mason) and Frances Neal (Ann), together as the cutie-pie couple who bring down Slade and her crew with surprising wit and affection. This film was clearly made to send the message that women should “toughen up”, and be strong - especially in the face of approaching war. Writers Arnaud d'Usseau and Richard Collins, focus on juxtaposing newspaper reporter Ann and crime queen Slade. Ann is much braver and more honest than our hero cop, Bill, and she literally saves the day. Slade, for all of her ruthless nature, spends most of her time trapped – like a wild animal - in a tiny claustrophobic hotel room, pacing about and tersely snapping orders to her male minions. Like many women of the period who stayed home, Slade comes off weaker than her plucky female counterpart. Ann, freely moves about the city to gather clues and get her woman (so to speak). A strange metaphor, indeed! Lady Scarface is a rare prize found among the TCM film archives, so enjoy it the next time it comes to late-night TV.